Adele's voice has proven to be a bit too powerful. Just days before the "Hello" singer was scheduled to perform at Wembley Stadium in the U.K., the Grammy winner shared some upsetting news about her health. As it turns out, Adele has temporarily damaged her vocal cords forcing her to cancel the last two nights of her tour. "I don't know how to start this. The last two nights at Wembley have been the biggest and best shows of my life. 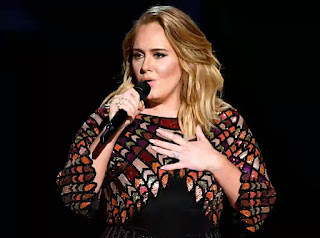 To come home to such a response after so long away doing something I never thought I could pull off but did has blown me away," Adele wrote to her fans in a lengthy Twitter post. "However I've struggled vocally both nights. I had to push a lot harder than I normally do. I felt like I constantly had to clear my throat, especially last night." She continued, "I went to see my throat doctor this evening because my voice didn't open up at all today and it turns out I have damaged my vocal cords. And on medical advice I simply am unable to perform over the weekend. To say I'm heartbroken would be a complete understatement." While the 29-year-old has been taking steroids and other aids to improve her condition, Adele said it would be almost impossible to do a whole show over the weekend. "I've considered doing Saturday night's show but highly unlikely I'd even make it through the set and I simply can't crumble in front of you all and walk out on you in that way. I'm so desperate to do them that I've considered miming. Just to be in front of you and be with you. But I've never done it and I cannot in a million years do that to you," she explained. "It wouldn't be the real me up there. I'm sorry. I'm sorry for your disappointment." While Adele is upset for her fans who have been eagerly waiting the show, she's also more than bummed to end her tour on such a sour note. After all, she's complete 121 shows and only has two shows left. "Who the f--k cancels a show at Wembley Stadium!? To not complete this milestone in my career is something I'm struggling wo get my head around and I wish that I wasn't having to write this. I have changed my life drastically in every way to make sure I got through this tour that started at the beginning of last year," Adele explained. "To not be able to finish it is something I'm really struggling to come to terms with. It's as if my whole career has been building up to these 4 shows." She added, "I'm writing this as the decision has just this moment been made, so I don't have any other, but of course refunds will be available if the shows can't be rescheduled. There will be more information over the next few days. I'm sorry, I'm devastated."